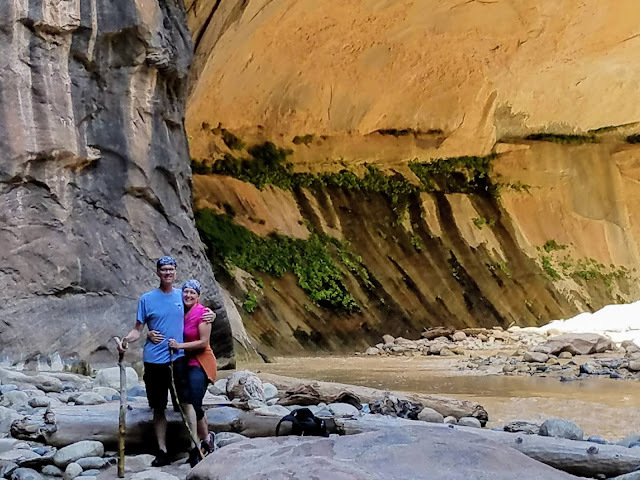 When we decided to go to Zion National Park, everyone said the same things... "OMG, Zion is amazing!" "Zion is our favorite national park!" 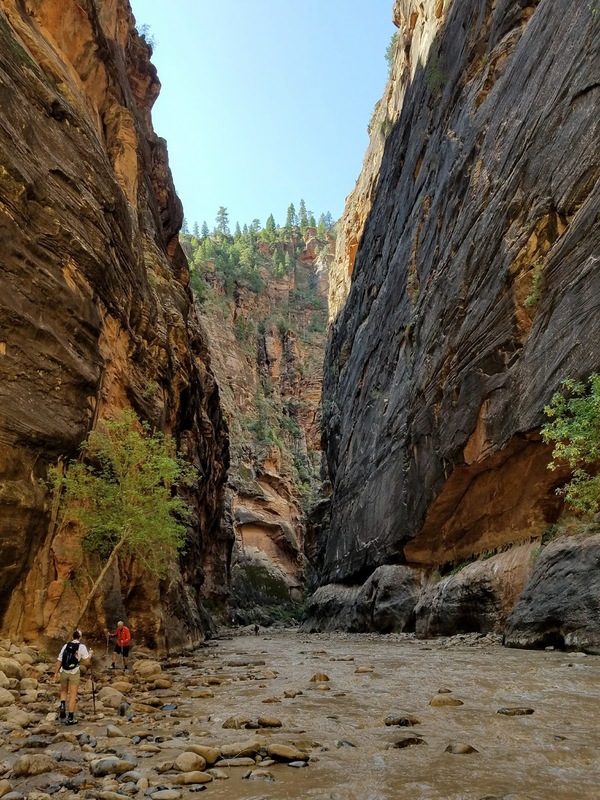 "You're gonna love Zion!" So we rolled out of Crater Lake and set our GPS for Zion. We didn't know much about it so we did some research along the way. 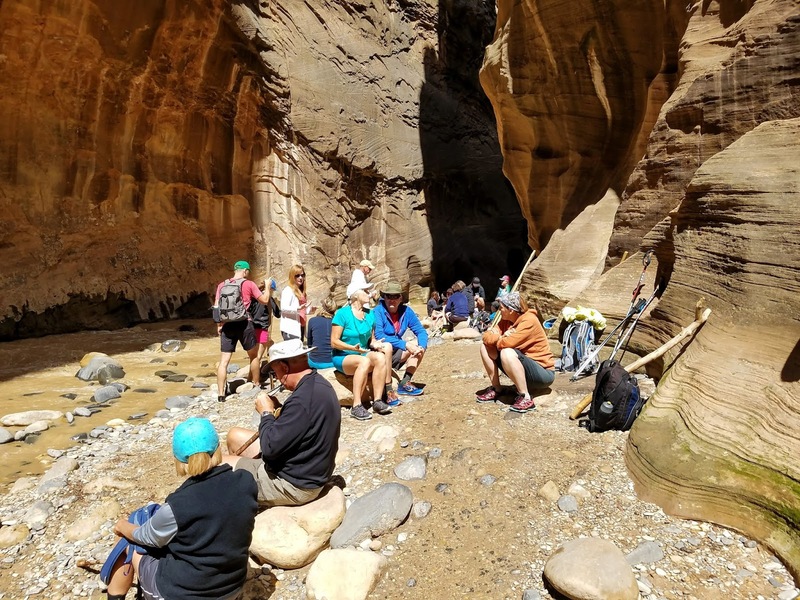 First we learned that Zion has a free shuttle bus service that takes you to eight stops along Zion Canyon Scenic Drive. This eliminates the need for cars and makes getting around the park super easy. 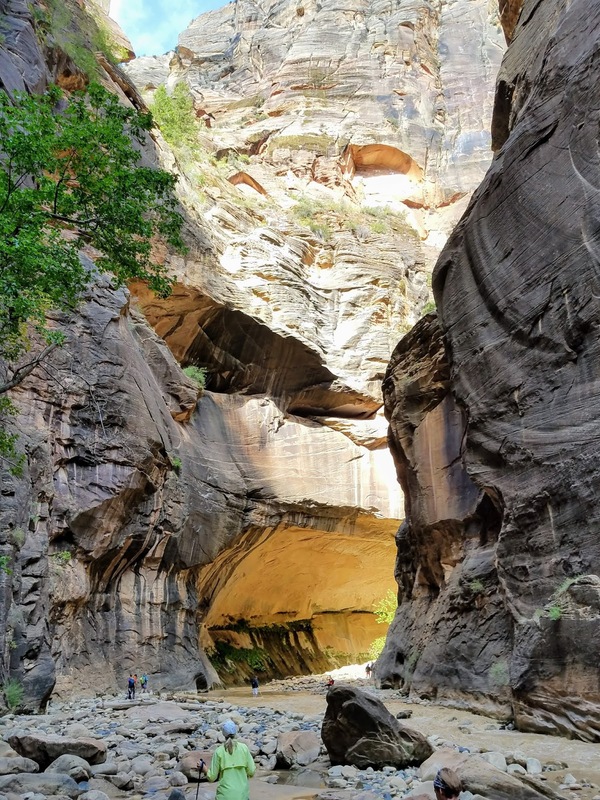 These shuttles will drop you at a museum, lodge, scenic rock formation or a trail head. The next thing we learned is that there are a couple of "must see" attractions at Zion... Angels Landing, The Narrows and the Emerald Pools. Ok, these things sounded pretty cool and we were intrigued. And when we arrived at this camp site 14 hours later we knew we were in for a treat. 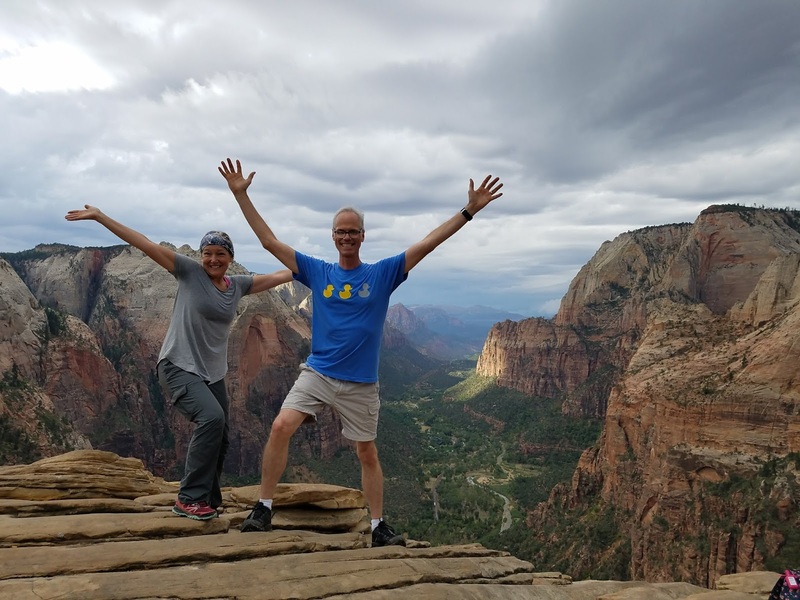 The first thing we wanted to know was, what is Angels Landing? It sounded so peaceful and nice... like a puffy little place where cute little cherubs stop for a break whilst they strum on their golden harps. And then we saw these. This was no angelic respite. This was one misplaced footstep away from certain death! You KNOW when the opening sentence on their main poster says, Since 2004, seven people have died falling from the cliffs on this route that this is not for the faint of heart, anyone with a fear of height, or anyone who is slightly clumsy. In other words... me. So now we had a decision to make. Do we face our fears head on and accept the challenge, or run away like frightened little kittens. And then we thought, "well, what is the worst thing that can happen?" And then we said, "death." And then we started crying. 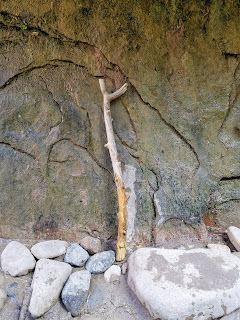 But eventually we decided that if we just took our time and didn't do anything dumb, like try to navigate it in a slippery rainstorm for example, we would be fine. 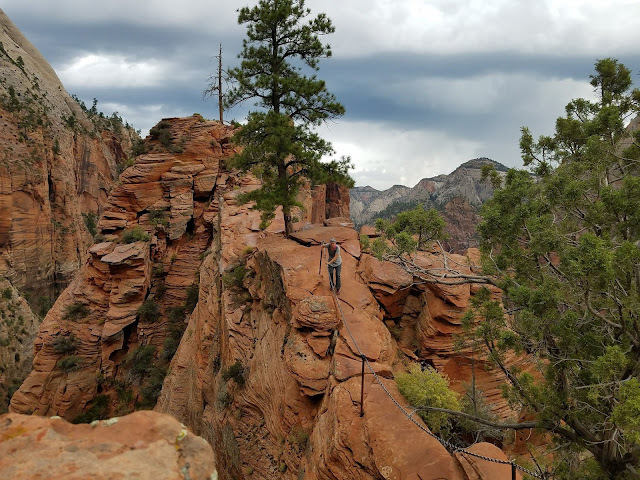 And we promised ourselves that if it got too scary or dangerous we would simply turn around and leave our dignity on the trail behind us maybe try it again some other time. And so we forged ahead. And holy crap what an adventure it was. Pictures don't do this hike justice, but they're better than nothing, so here is just a tiny sample of the majestic beauty of this heavenly place. As you climb the main trail, this is what surrounds you. Eventually you will get to a natural "bridge" that is only a few feet wide and drops off hundreds of feet below on either side if you slip. As I crossed it I wanted to just close my eyes and hope for the best but quickly decided it was in my best interest to pay attention and take it slow. Here's Charli starting her traverse across the bridge. I went first and turned around to take this pic. 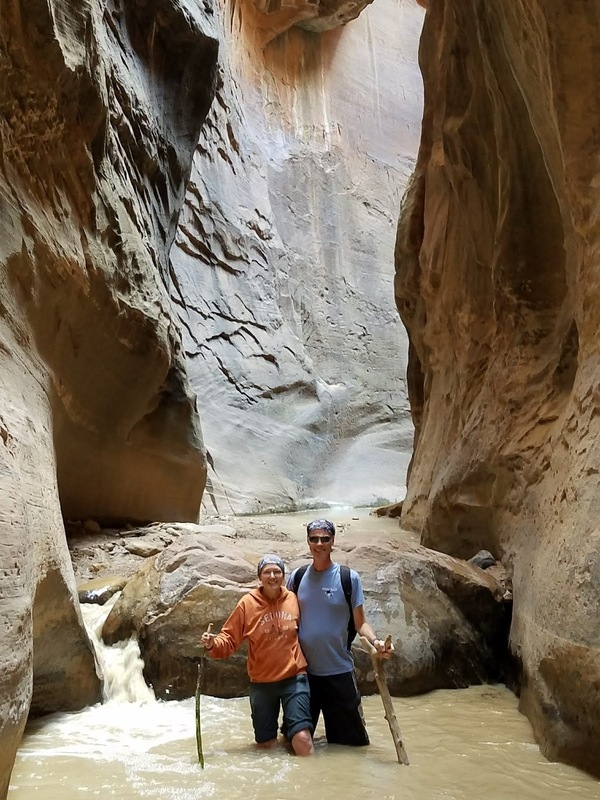 It's important to note that if not for the guide chain this would have been a non-starter for both of us. 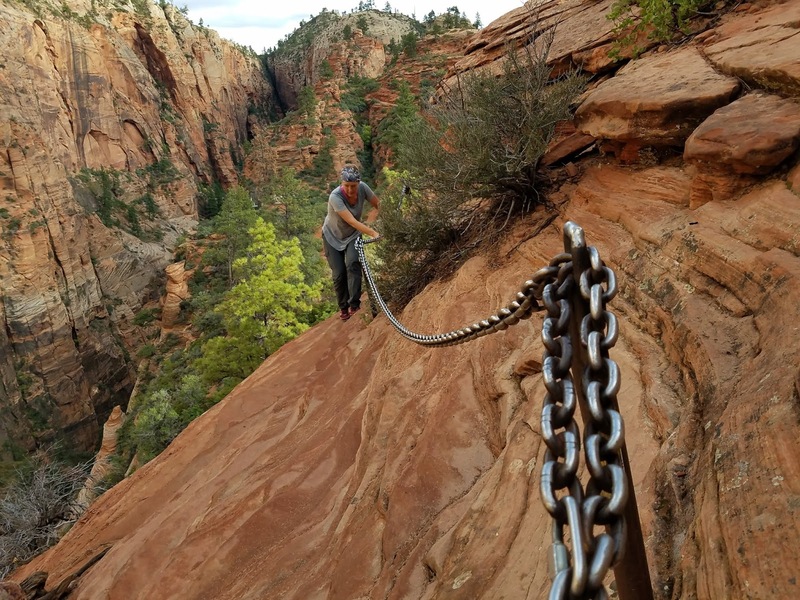 After crossing the bridge, you are faced with the climb to the top of Angels Landing. Here is what it looks like as you approach. Pish-posh, that doesn't look so bad. AND... here's what it looks like while you're ascending. 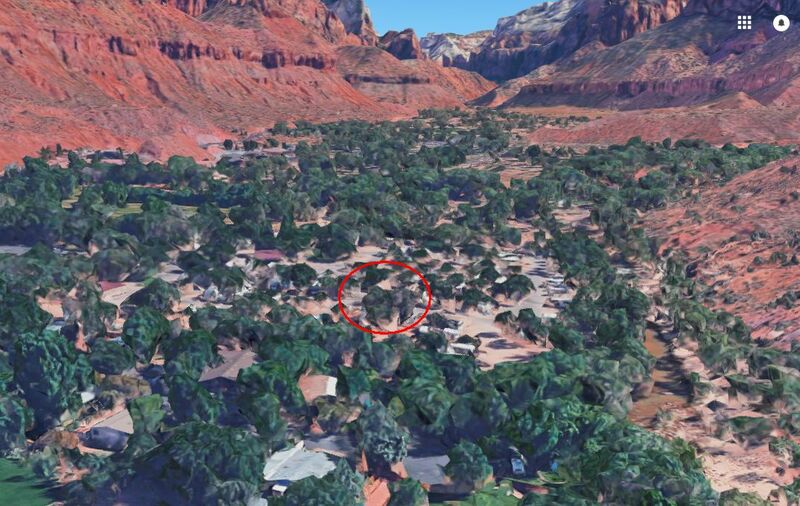 Note that the lower side of this slope drops about 1200 feet. Also note that at this precise moment both of our hearts were pounding like jackhammers. But eventually we made it to the top. Alive. And it was good. SO... after spending about 15 minutes at the summit, we started to notice that those clouds behind us were getting darker, and moving towards us! This meant one thing. GET THE HELL OUT OF THERE! And because the only way down was the way we came up, we literally had to make the same heart-stopping journey in reverse. But then the unthinkable happened. First the lightning in the distance. "Honey I love you. We're going to die. Do the kids know where our insurance papers are?" And no sooner did we put our first step onto the slanty ledge from hell when sure enough... rain! And not just a sprinkle, but "the heavens opened up" kind of downpour. 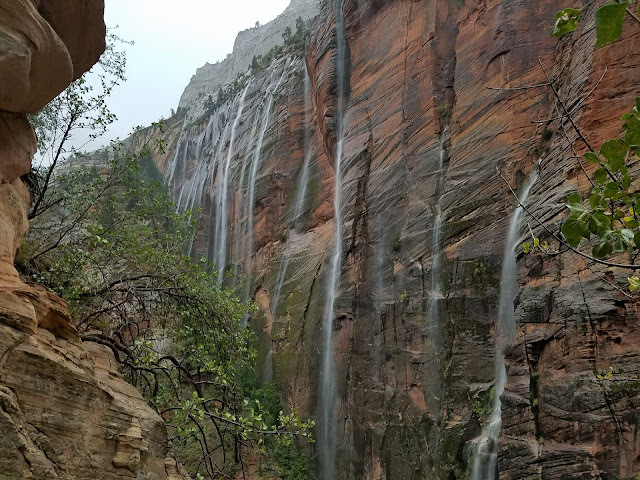 SO much rain in fact came down that the canyon walls erupted into waterfalls. And no, I'm not exaggerating. 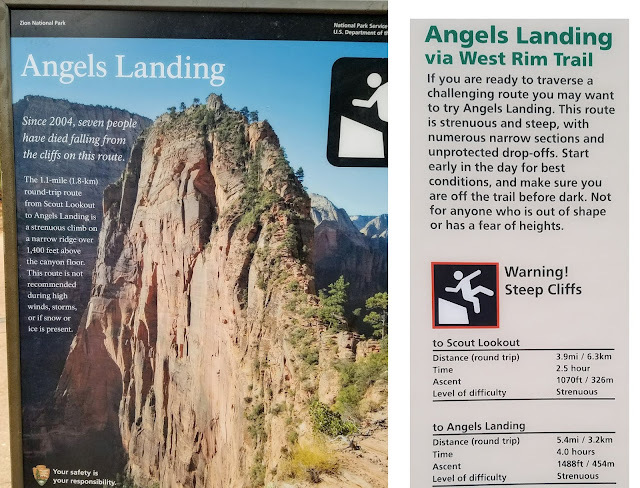 Fortunately we didn't slip to an untimely death and become another statistic on the Angels Landing welcome poster. Sure it was scary, but it was also the single most exhilarating thing either of us have ever done in our lives. And because of that, I would do it again in a chest-pounding heartbeat. On a nice dry day. 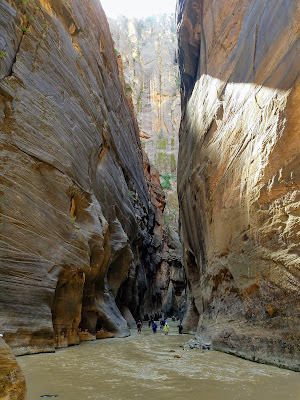 The Narrows is one of those things that on the surface doesn't seem to make a lot of sense. 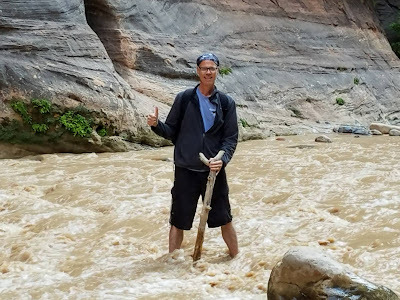 "So here's the deal see... you put on 'water shoes' and walk up a muddy river against a strong current with a bottom full of large rocks for about 5 miles. 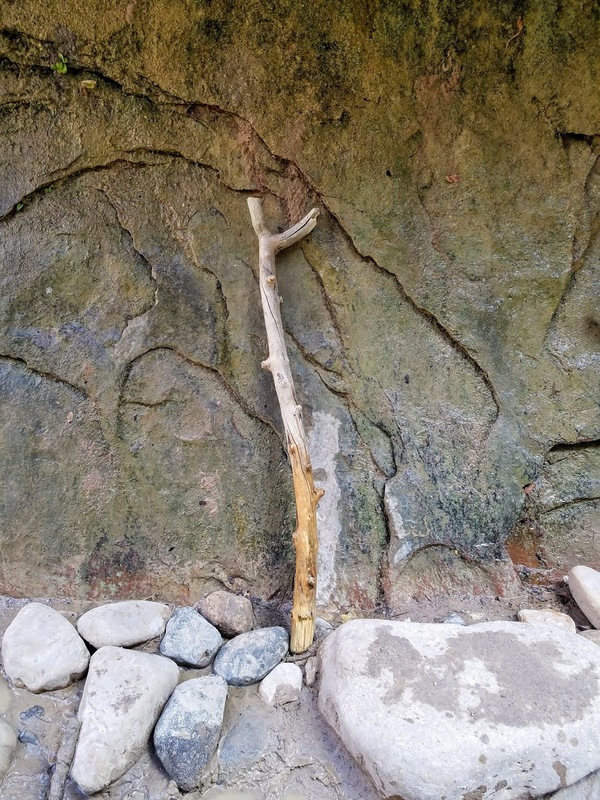 Oh and you have to find a big stick somewhere to keep your balance otherwise you'll fall on your face. Either that or buy one in our gift shop for 10 bucks. Then, after about 3 hours you'll get to a place that's really pretty so you can tell everyone you did it later on." However... sensible or not, we were NOT going to be denied. 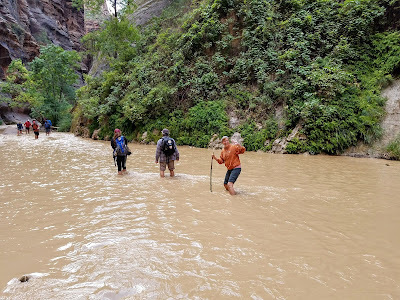 And there was a touch of irony to the fact that the very day after a huge rainfall we would decide to take a hike up a river that had multiple warnings to NOT hike up the river after a rainfall because of potential flash flooding. Ok, irony might not be the right word. What's the word I'm looking for... oh yeah, stupidity. But the day was beautiful and the river looked fine. 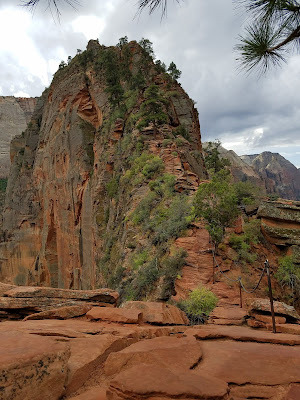 And besides, gobs of other people were making the pilgrimage so we made a similar decision to the one from Angels Landing. If it got too hard or dangerous we would simply turn around. 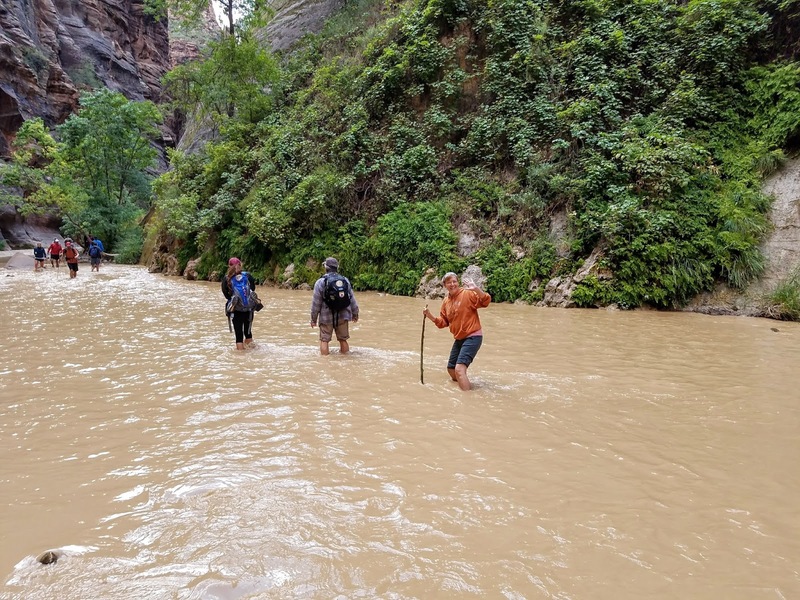 Or, if a flash flood hits we would get a free fast ride back down. Bonus! So hike up the river we did. And it was tough, and it was wet and it was beautiful! But most of all, it was really, really fun. We hooked up with some other people and chatted our way upstream, had a nice lunch at "Wall Street" (the unofficial destination of the hike) and soaked up the sun. And our shoes. Here's a few pics of this adventure. 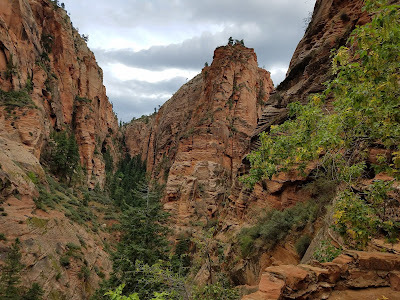 The next day we hiked the Emerald Pools loop and it too was amazing, but I don't seem to have any pictures for some reason. I guess I ran out of film. 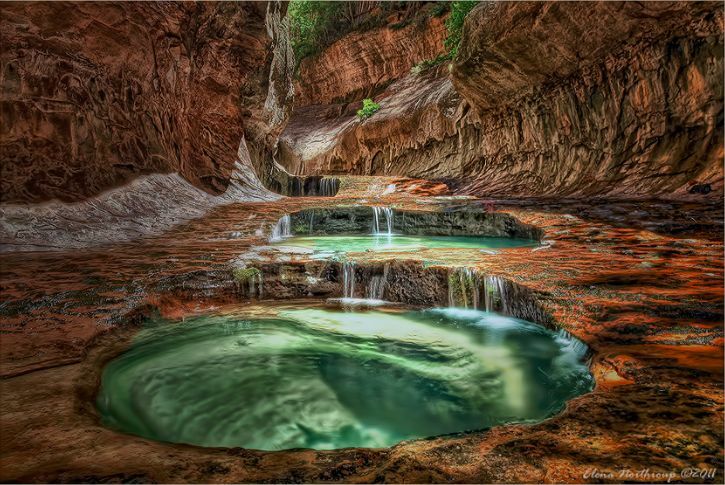 But here's one I stole from the internet so you can see what a magical place this is as well. 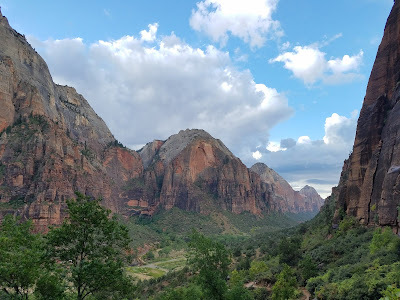 The fact is, pretty much everything about Zion is magical and ridiculously beautiful, and now I am officially that guy. You know, the one who will tell you "OMG, Zion is amazing!" "Zion is our favorite national park!" 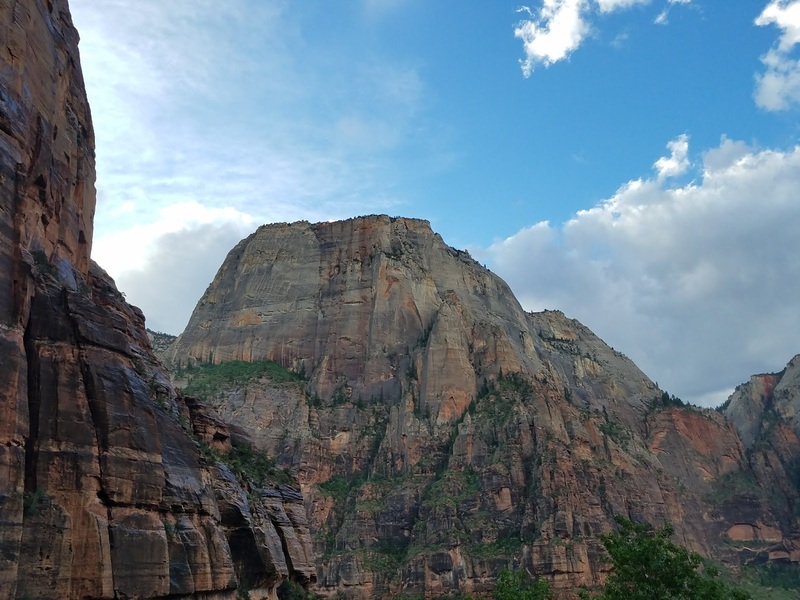 "You're gonna love Zion!"